This earring sparkles and reflects light absolutely beautifully. 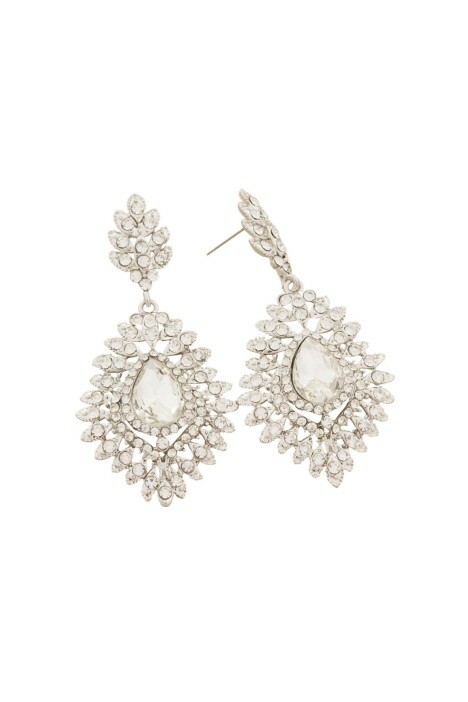 A classic statement earring, wear this with an evening gown to be the belle of the ball. It features a centre teardrop glass crystal and is set in silver metal with diamantes. This piece is perfect to rent for black tie events, especially when paired with a gorgeous v-neck, a floor-length gown, or a striking midi! Wear this statement piece with a hired silver clutch to bring another dash of glamour to your outfit to really pop! For more black tie outfit inspiraiton, check out our 'What to Wear to a Black Tie Wedding' blog post!